Sometimes, if you've used a detailed paper punch on materials that are too thick or flexible, the punch will begin to stick or not cut properly. If this happens to you, can you fix the punch or is it a waste of time? If your problem is a paper punch that works on some materials but is dull on one part of the cut, try these tips first to keep paper punches running smoothly. Sometimes "sharpening" the punch on aluminum foil, or very fine sandpaper or sharpening paper is enough to set up the blades of the punch to more evenly cut the paper. Punching through waxed paper or silicone treated baking parchment can help add a lubricant (wax or silicone) to the surfaces of the punch to help keep it from sticking. Put the Punch in the Freezer - The metal of some punches will contract enough when it cools to allow the punch free itself so you can clear whatever is stuck. This works best for punches with fairly simple outlines. It may not work for complex punches. Leave the punch in the freezer for several hours to see if it can be unstuck this way. Use a Penetrating Oil - Penetrating Oils, like WD-40, can clear waxy or sticky buildup which may be preventing a punch from returning to its regular position. Spray a little on the surface of your punch to allow it to penetrate through the cutting surfaces. Let the punch sit for an hour or so on it's back so the oil penetrates through the metal layers. Try to work the punch again to free it. Clean off any excess oil, and punch through plain printer paper several times to make sure your punch is free of oil traces which might ruin your paper project. Take the Punch Apart - this is a last resort option, but with care, you can rehabilitate a damaged punch. See the steps which follow for how to take the punch apart, correct any problems and reassemble the punch. To attempt repairs on paper punches which won't come free using the methods in the previous step of these instructions, you may have to take the paper punch apart. To do this, carefully check around the edges of the punch where the plastic cover meets the metal base. Usually, you will be able to see a small metal tab. This tab helps to hold the metal base to the cover. Wearing eye protection in case the spring explodes from your punch, carefully use a fine bladed screwdriver to pry the plastic cover gently away from the base at the area of the tab. You shouldn't have to exert a lot of force. If you get the right point on your plastic cover, the cover will pop off easily. With the cover removed from your decorative paper punch, you should be left with the pieces you can see in this photo. There will be a base plate that holds the paper and directs the moving punch, a return spring which allows the punch to bounce back when you release your hold or pressure on the punch, the moving punch head, a cap for the moving sections of the punch, and a cover to cover all the working mechanisms and protect your hands. To begin restoring your punch, remove the spring and plastic parts, and try to remove any bits of paper which are stuck in the jaws of the punch. Use tweezers, be careful not to change the shape of the punch blades and keep your fingers well away from any sharp surfaces. If your paper punch doesn't come free when you remove any residue from previous cutting projects, you may have to apply penetrating oil such as WD-40 to the metal surfaces. Allow the penetrating oil at least an hour to seep into the metal sections of the punch, then gently work the moving punch section free of the base. Once you have your paper punch apart, you can check the edges of the base and the punch blade, to see if there are any rough patches of metal on the blade or the base, which are causing the punch to stick. Punches are machined to a very high tolerance, so they must fit exactly through the base to punch out the paper design. slight roughness on the edges of either the blade or the sections of the base the blades pass through, can cause the blade to stick and the punch to seize, even on regular printer weight paper. Note: Craft punches, especially elaborate ones, are not designed to cut through the lightweight card. More elaborate punches may only work with lighter weights of printer paper. Get tips on paper for printable miniatures and learn the various weights of paper and how to store it so it won't jam in a printer. The same information is useful for working with decorative paper punches. If Your Punch Has Rough Edges - if you can see rough edges on the cutting parts of your punch, or you can see bits of metal that might cause the punch to bind, use very fine sandpaper (600 grit or finer), or a fine needle file to clear away the excess metal or file it smooth. Do not work a file or sandpaper across the sharp edges, only file the sides of the cutting blades to remove rough spots. Filing or sanding across the edges will dull the blade. To put your decorative paper punch back together, first ensure all the working surfaces are clean ​and treat the surfaces with a product like "cutter glide" to help keep the blades running smoothly. Test that the blade fits smoothly back into the base. You may have to rotate some patterns to get the correct fit. The blade should easily pass through the base, and slide easily back up again. If the blade fits correctly into the base, remove the cutting blade from the base and refit the spring, then the blade. Align the plastic cover that fits over the blade with any alignment marks (see photo this page). 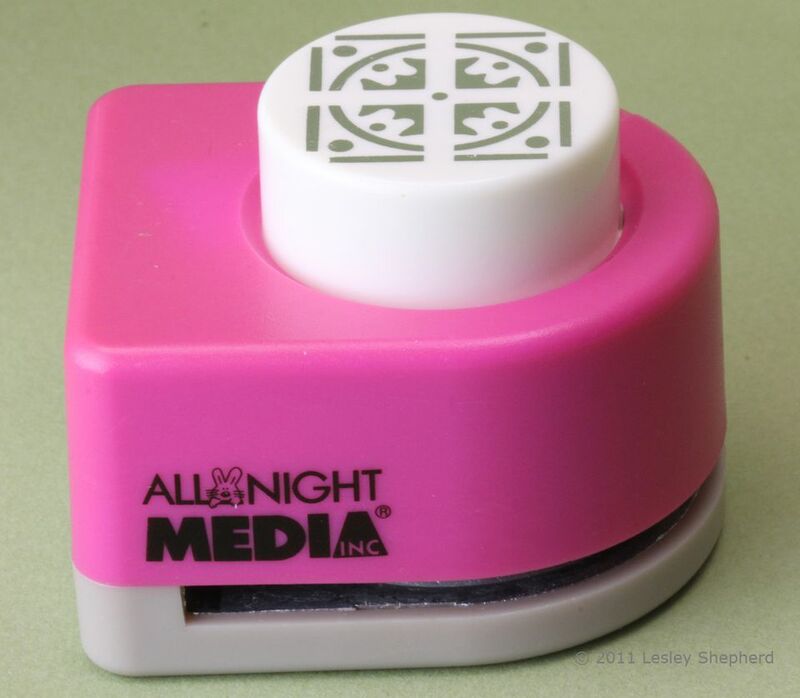 This will ensure you know which way your design lines up when you go to punch your paper. If possible, run a test of the cutting surfaces on a piece of paper, taking care to keep your fingers well away from the cutting blades and the spring. Finally, when you are sure your punch is functioning well, refit the cover, and press it down over the tab that holds it in place.